Today our youngest, daughter Erin, graduates from high school. Needless to say we are thankful, proud and overjoyed. Erin is an amazing girl. We have been blessed with three wonderful children and she is no exception. The picture in the post isn’t recent, but it has always been one of my favorites of her. 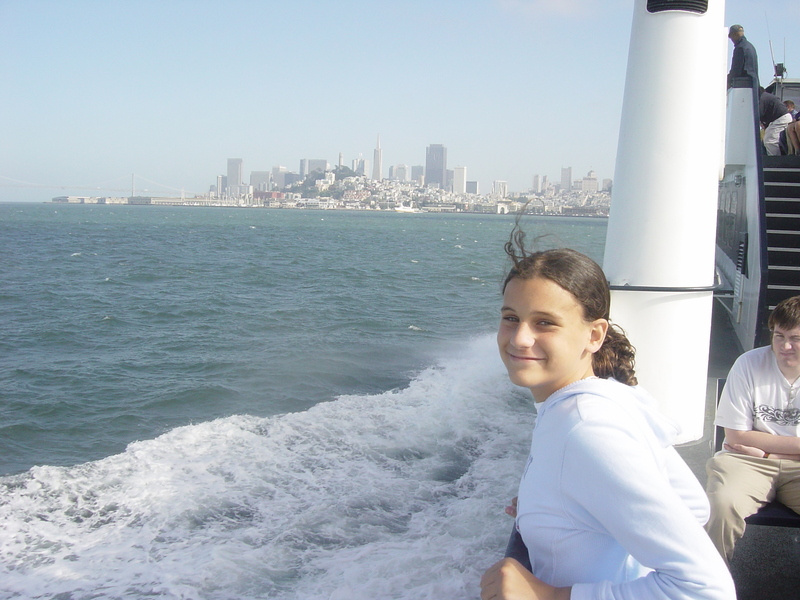 It was taken about seven years ago aboard a boat headed for Alcatraz off the coast of California, on the first leg of a great family vacation. The picture captures what I think of when, with tears of joy, I consider our baby girl. It is one of those many ‘snapshots’ that run through our minds and hearts as we consider her life at this special moment. For me it seems symbolic of the way Erin has always simultaneously maintained her roots and her potential. On the boat, as in life, she is firmly established, solidly at home, but also, because confident that she is loved, she is fearlessly extending and reaching – seeing the world she lives in – breathing in the moment – wondering what is out there – thrilled with the prospects – filled with love to share. From the moment she entered into the world Erin has been a person of tenacity and fiery character. As a little girl she had a unique guttural growl that she freely expressed whenever she deemed it appropriate to register disapproval or frustration – to friends or strangers! However through the years, as she has matured we have come to realize that her tenacity and growling were all part of God’s work of sculpting a young woman of passion, who cares for the weak, fights for those she loves and stands on principle, even when it hurts. Along with her older sister, Erin reflects her mother’s beauty, inside and out. She loves Christ and enjoys a deep and reflective relationship with Him. That picture informs this dad’s heart that throughout her life Erin will settle for nothing less than something sweet and beautiful. Something she will discover, while extending out, reaching for the oceans, stars and landscapes, that God seems to have laid out for her to discover – something as breathless as she leaves me with when having enjoyed yet another encounter with our precious daughter. At this moment I can’t even begin to think about how profoundly Katherine and I will miss Erin when she leaves for college in the fall along with her sister Emily. But on this day, while we have her, and as she officially becomes a high school grad, we celebrate her. We are so proud and we love her with every fiber of our beings. And once again, with the deepest of thankfulness to the Lord, along with John, the apostle, we find that ‘we have no greater joy than to know that our children walk in truth’ (3 John 1:4). What a heart-warming illustration of a father’s love for his daughter. Congratulations to Erin on her graduation, congratulations to you and Katherine for rearing three wonderful kids and all thanks and praise be to God. I love your precious girl! I liked her the minute I met her back when she was in second grade. She was, obviously, “fearfully & wonderfully made” by the master, but she is also a product of her parents gospel-driven way of life! She has taught me many things, without even realizing it! Can’t wait to follow her next chapter! You are currently reading Celebrating Our Sweet Grad at unfinished1.